Les 3 Fromages new album out 2 march 2018 Wagram Music / One Hot Minute! When Les 3 Fromages plays the famous "Ça Plane Pour Moi" with Axel from WIZO, here is what it gives. For the last decade, Les 3 Fromages have toured all over France to introduce their own unique style, Rock'N Drôle. 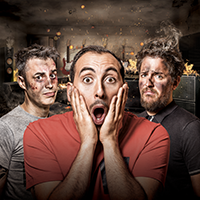 Rock'N Drôle is a smart mix of rock and comedy which they share through explosive shows, and no one gets tired of their inspired riffs and offbeat lyrics inspired by the greatest comedians. In the vein of american rock bands such as The Offspring, Green Day, or Blink 182, Les 3 Fromages have a unique flavour, which can only be properly tasted in live!